This must be my season for jazz novels. 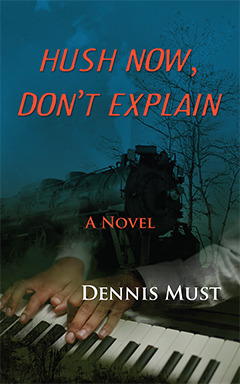 Almost immediately after reading 2 A.M. at the Cat’s Pajamas, I receive Dennis Must’s Hush Now, Don’t Explain for review. Unlike Cat’s Pajamas, Must’s novel takes a starkly realistic view of history — racism, sexism and class relations, all within the framework of jazz. The story follows Honor, an orphan, at the end of Word War II, as she leaves her dead-end town of DeForest Junction on a quest to learn about her birth mother. With her is her friend Billy, a mixed-race boy looking for the man he believes is his birth father, and shanty store owner Augustus Willard. There are some powerful moments in this book, such as when Billy gets attacked and branded on his chest for his skin colour and when one of the characters decides to turn back for love. I also like the cadence of Must’s writing, which draws the reader into how the characters speak. Overall, however, there’s a lot going on in Hush Now and I don’t think it all necessarily came together. There’s a heavy-handedness to the story, a desire to explore so many different issues and make a strong statement about each one, that at times, it just felt crammed. At its heart are some very personal, individual conflicts — Honor and Billy’s search for their past, Augustus’ search for a certain kind of future — yet only Augustus’ story, and to a lesser extent Billy’s, has a satisfying payoff. Honor is the main character, but her story felt the least authentic. I like how she had to dress up as a man to stay safe, but given how easily some other characters saw through her facade, it seemed more a metaphorical gesture than anything else. Possibly because her story felt the most heavy handed, she never felt real, and when she experiences something horrific later on in the story, it lacked emotional impact. Thank you to Coffeetown Press for a copy of this book in exchange for an honest review. This entry was posted in Book Reviews and tagged 50BookPledge2014, Fiction, Historical by Jaclyn. Bookmark the permalink.